If you are celebrating a festival, the first thing comes to your mind might be family get together and sweets definitely. This week's blogging marathon is going to be a special theme, sounds interesting rite. Ok let me confess that this week's blogging marathon was one among the favourite themes i have done so far. Yes its festival theme, Srivalli suggested to make festive foods for Raksha Bandhan, Ganesh Chathurthi and finally for Krishna Jayanthi, apart from Raksha Bandhan which i never celebrated at home Ganesh chathurthi and Krishna Jayanthi both are very close to my heart. Honestly i came to know about Raksha Bandhan only after my schooling that too through a movie, see how rare we go to movies.Raksha Bandhan is a festival to celebrates the love and duty between sister and a brother. This festival is an ancient festival and has many myths and historic legend linked to it. On Raksha Bandhan, sisters tie a rakhi, the sacred thread on her brother's wrist, which symbolizes the sister's love and prayers for her brother's well being. This festivals falls always on full moon day of Shravan month of the Hindu lunisolar calendar. Usually once the sacred thread is tied to the brother's wrist, the sister applies a tilak on the forehead of her brother and then feeds her brother with her hands some sweets or else dry fruits to celebrate this festival of bond.Since i want to showcase all the three festivals from this week's theme, today its going to a sweet for Raksha Bandhan.I prepared this delicious burfi simply with tinned kesar mango pulp and dessicated coconut, an easy peasy sweet gets ready very quickly if you have tinned mango pulp and dessicated coconut at home.This burfi also goes to this month's Shhhh Cooking Secretly Challenge started by me three months back.We are having fun in guessing other's secret ingredients through the pictures each of us have been sharing in our FB group. This month's pair for me is Joanne of Whats On The List she gaves me coconut and nuts as secret ingredients while i gave her zucchini and onion, check her space for her beautiful creation. Check out the Blogging Marathon page for the other Blogging Marathoners doing BM#42. Add the sugar, dessicated coconut and cook for a while until the mixture turns bit thick. Add the cardamom powder, cook until the mixture comes out from the vessel. Spread the mixture on a greased plate, sprinkle immediately the chopped cashew nuts. Let the mixture gets cool well. 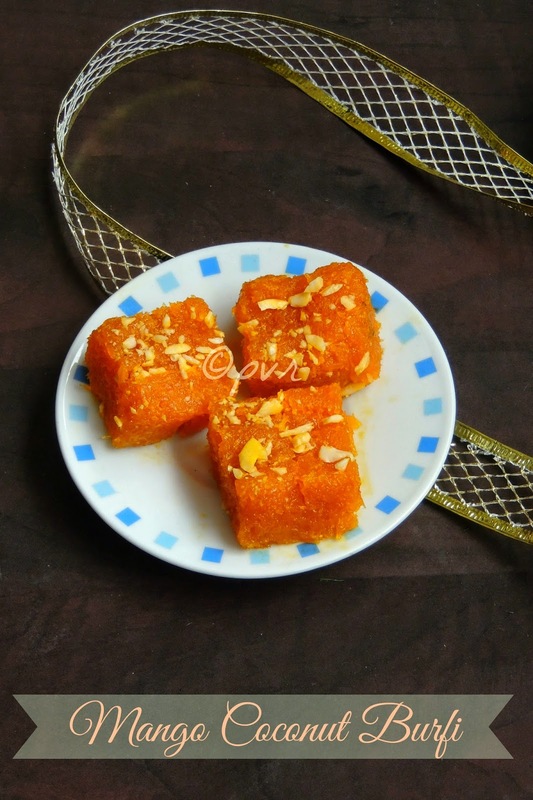 Slice the burfi as squares, arrange in an air tightened box. Stay prefect for two days in room temperature and for a week if arranged in fridge. Lovely and delicious looking burfis. Simply mouthwatering. You know what, even I did not really celebrate raksha bandhan until I moved to US. I knew about it since childhood but for some reason it was never a big festival or something we looked forward to when growing up. sin at it high..i can finish the full try kaa.. jus gorgeous.. Awesome colour.. I have a packet of frozen mango puree - this looks like a perfect dessert to make :) thanks ! but is the sugar essential, generally commercial purees do have sugar isnt it ? Such delicious looking burfi Priya..very nicely done. I feel like tasting this now...yumyumyum! Mango and coconut..a perfect combination and it looks very delicious! OMG..I Cannot resist to grab a piece...yumm..love the vibrant colour..thanks for sharing priya..
Lovely! Love the color on that barfi! So appetizing! 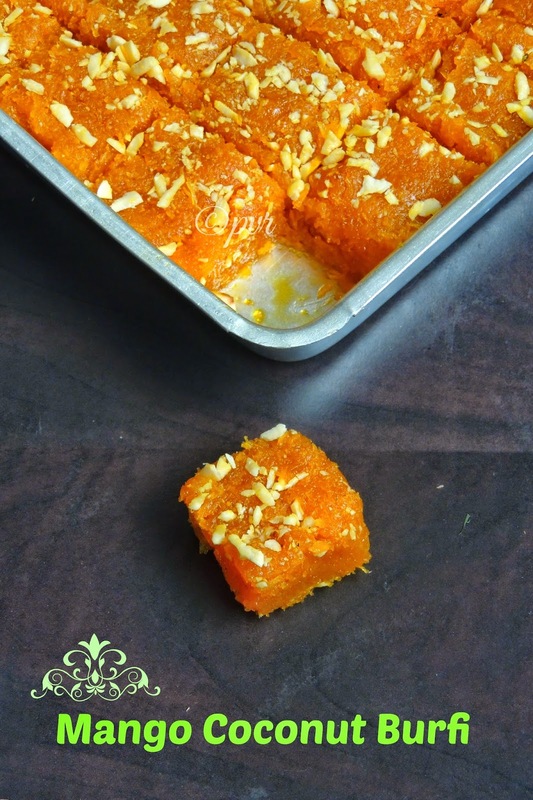 Burfi looks delicious.. nice combo of mango and coconut..
That is a beautifully done barfi and an awesome combo. Must try this one. Coconut and mango sound like a delicious combo for burfi. Yummy. That's a gorgeous dessert with a lovely hue. wow!! !Love the colour and a lovely combo. Droolling Priya!! Can I replace the tinned mango pulp with fresh mango pulp?? ?